Knights Templar Dagger with Sheath | BUDK.com - Knives & Swords At The Lowest Prices! Imagine yourself in the legendary order of the Knights Templar. Fighting in the Crusades, you’re a chivalrous-yet-deadly knight atop a stately white steed, riding swiftly toward the enemy’s camp in shimmering suit-of-armor. The Pope’s trusted personal assassin, you calmly sneak into the Ottoman general’s tent as he sleeps. 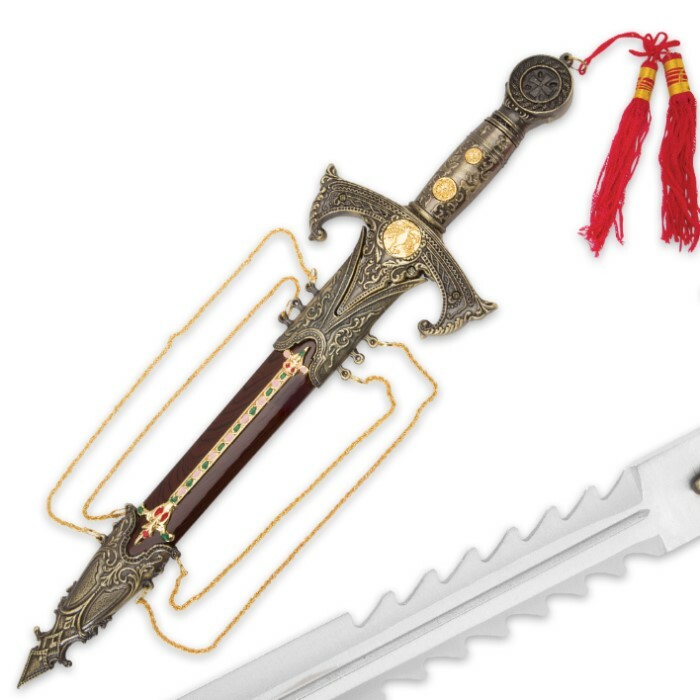 Quickly but silently you draw a shimmering, ornately detailed dagger and strike! In a matter of seconds you’ve returned the coveted Holy Land to the Church in Rome. When you wield the Knights Templar Dagger, it’s not so hard to picture yourself in such a scenario. Paying homage to the storied order, the richly decorated cast metal handle is laden with Knights Templar emblems and symbolism, set amongst exquisitely figured patterns in forged relief. The included coordinating sheath is equally well-appointed, and the sleek stainless steel blade glimmers with sharp, dual-serrated edges. A red tassel hangs gracefully from the pommel, and gold-colored braided cord is tied to lanyards at the top and bottom of the sheath. 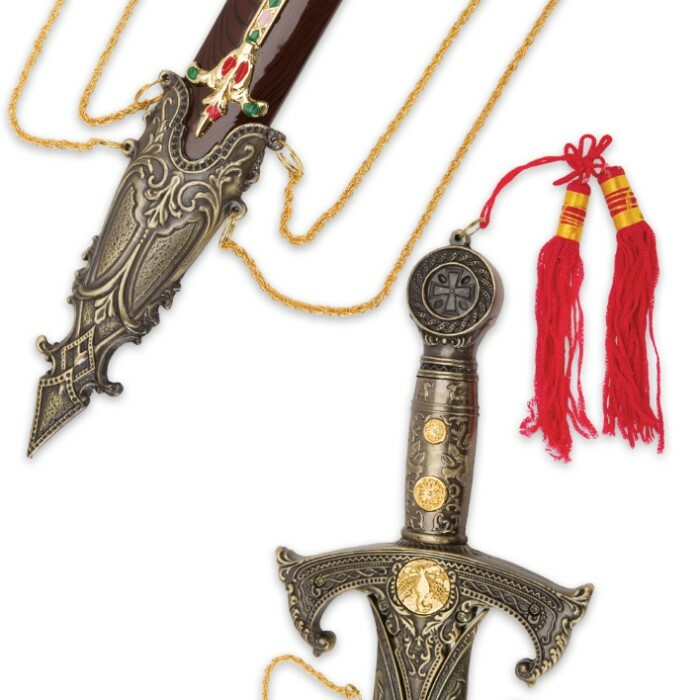 Truly stunning in both design and craftsmanship, the Knights Templar Dagger displays brilliantly on a fireplace mantle, bookshelf, curio case, dresser, or practically anywhere in your home or office. 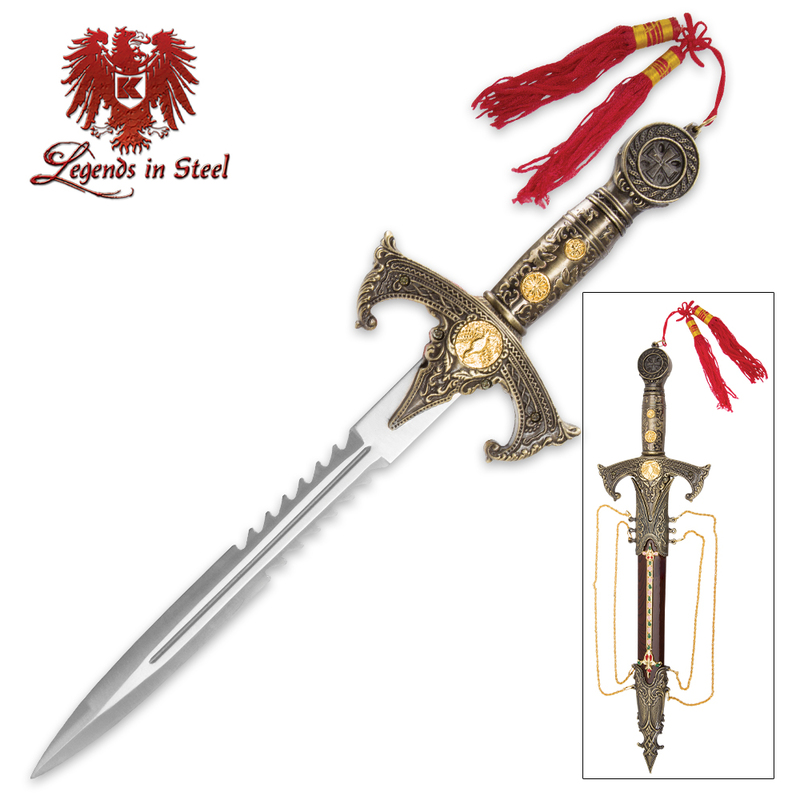 Also great as a historic prop or for cosplay, this beauty is sure to turn heads wherever you show it. Makes a terrific gift for sword/knife collectors, medieval history buffs, Middle Ages reenactors, Knights Templar scholars/hobbyists, cosplay devotees, or anyone who appreciates great art and craftsmanship. At this low price, buy one for yourself, as well! Measures 17” overall. United, XL1152. A Knights Templar Dagger Review.